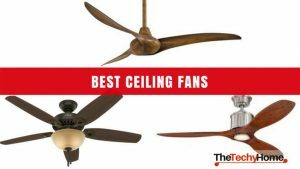 Choosing a quality ceiling fan for the kitchen is not only important because of the esthetic part, ceiling fans can create an overall much better experience throughout your home. 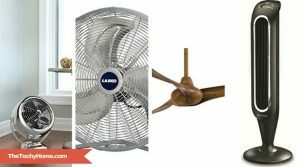 Kitchen fans come in various shapes and sizes and you can choose a ceiling fan for almost every style of your home. Ceiling fans have different characteristics. Some of them spend more electricity while others save more money. 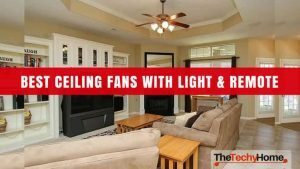 Ceiling fans require investment, but you don’t have to pay a lot of money to get the best experience possible. Ceiling fans are definitely a much better option than air conditions, for example, since they spend a lot less electricity and are much healthier overall. Ceiling fans only distribute the air around the room, which means they don’t use the air from outside or the air doesn’t circulate. Even though the air doesn’t come from the outside or it doesn’t circulate, they still manage to cool down the air in every room especially if they are strong. Another benefit of the ceiling fans in the kitchen is getting rid of the smoke that gets created during cooking. Even though you probably have a smoke ventilation system, it is always a good idea to use the ceiling fan as additional help. 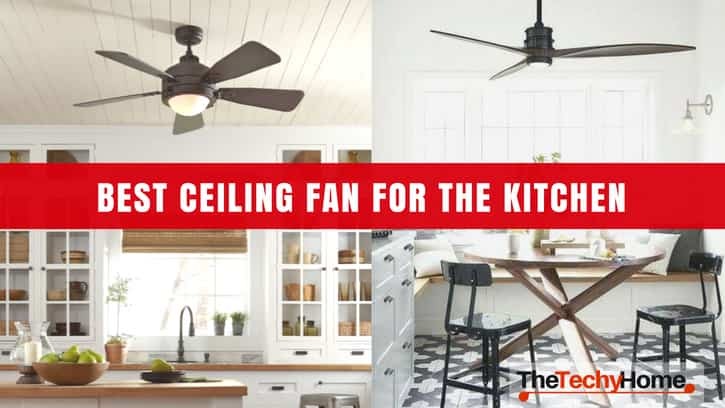 In today’s article we are going to mention some of the best option for kitchen ceiling fans with light sand how to get them. 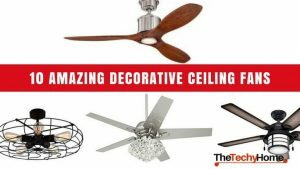 We will include ceiling fans with the best features but also consider all the price ranges. So, if you are on the hunt for a kitchen ceiling fan, hopefully this is going to be helpful. All of the products can be found on Amazon.com. 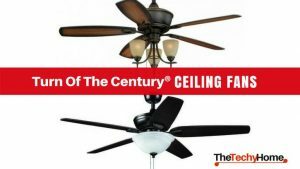 The Westinghouse ceiling fan is a great option for a kitchen ceiling fan, if your budget is not over 100$. This ceiling fan has two light 24 inches blades that are reversible. This ceiling fan might be on the cheaper side, but this doesn’t mean it is not powerful. When it comes to coverage, it can cover up to eighty square feet of space 8 x 10 feet. 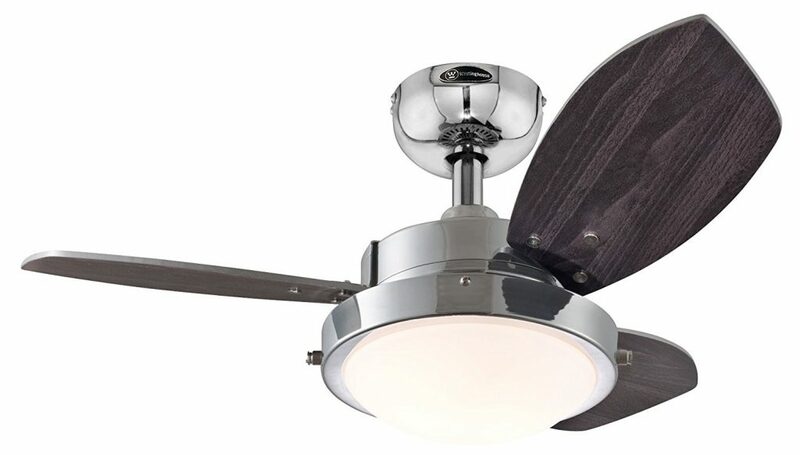 This kitchen ceiling fan has a 153 x 9 mm silicon steel motor that has a dual capacitor. Fan has a three speed option and a reversible switch that can be used for year-round. The airflow of this kitchen fan is 2,039 cfm. Energy usage is 31 watts if you choose to not use the light. The efficiency of the airflow is 68 cfm per watt. This ceiling fan includes a down rod that has 4 inches and a 78 inch lead wire. 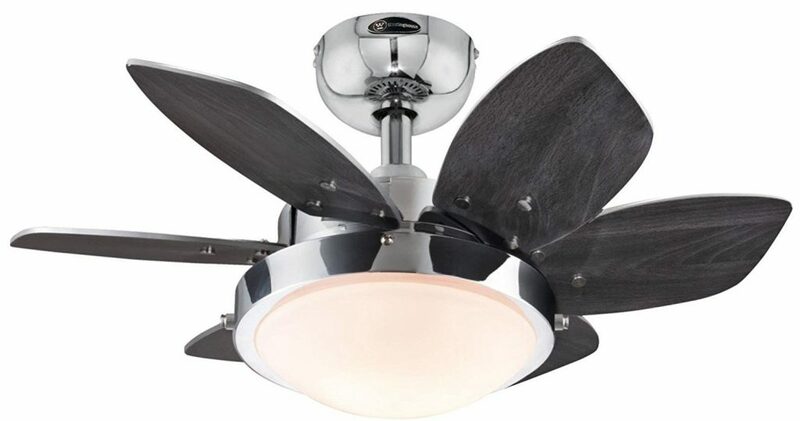 To have kitchen fan light with this ceiling fan, you will need two candelabra base light bulbs (40 watts). The style of this ceiling fan is modern and it is made out of chrome, glass and the dimensions are 14.5 x 12 x 11 inches. Voltage is 120 volts and the wattage is 31 watts. This modern style kitchen ceiling fan is not going to be a burden on your budget, because the price is only 60$. This kitchen ceiling fan has a modern design and three blades for maximum room air circulation. It can cover 144 square feet (12 x 12). Motor is made out of 153 mm x 10 mm silicon steel motor that has a dual capacitor. Fan for the kitchen has three speeds and a reversible switch. Airflow on this kitchen ceiling fan is 4,083 cfm and it uses around 51 watts of energy (if you don’t use the kitchen fan light). Down rod is 4 inches and for light it uses two candelabra light bulbs (40 watts). 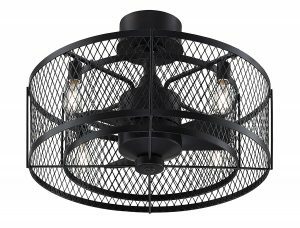 This light ceiling fan has only 10 pounds and it is going to look perfect and stylish over your kitchen table. Dimensions are 18.5 x 9.2 x 10.4 inches. It is made out of glass and steel. Voltage is 120 volts and the wattage is 51 watts. Another cheap option for a kitchen ceiling fan is the Westinghouse ceiling fan with the price of only 71.52$. This wengue chrome fan for the kitchen with the size of 30” offers a ventilation system with lights. This lightweight ceiling fan has only 11 pounds and the dimensions are 14.6 x 10.8 x 11.2 inches. It is made out of chrome and glass and the shape is circular. Voltage on this quality ceiling fan is 120 volts and the wattage is 40 watts. If you have a little more money to spend on your kitchen ceiling fan with lights, then this Fanimation ceiling fan is a perfect option. With the price of 230$ this ceiling fan is on the pricy side but you definitely get a quality product for this price. It is a cage-like ceiling fan with only 23 inches. Wattage on this ceiling fan is 40 watts and it uses 12 candelabra base bulbs. This kitchen ceiling fan has a remote control with a dimming feature. The timer on the remote controller can be set to 1, 3 and 6 hours. The motor has 3 speeds with a reverse. Airflow on this kitchen ceiling fan is 1360 cfm and the energy use is 36 watts. Efficiency of the airflow is 38 cubic feet per minute per watt. If your home is more a rustic style home, then this ceiling fan is going to be a perfect fit. It is made out of aged bronze and the finish on it is antique. Dimensions are 19.7 x 19.7 x 12.8 inches. This ceiling fan belongs to the small kitchen ceiling fans.